In addition to adding new storage domains that contain no data, you can also import existing storage domains and access the data they contain. The ability to import storage domains allows you to recover data in the event of a failure in the Manager database, and to migrate data from one data center or environment to another. Importing an existing data storage domain allows you to access all of the virtual machines and templates that the data storage domain contains. After you import the storage domain, you must manually import each virtual machine and template into the destination data center. The process for importing the virtual machines and templates that a data storage domain contains is similar to that for an export storage domain. However, because data storage domains contain all the virtual machines and templates in a given data center, importing data storage domains is recommended for data recovery or large-scale migration of virtual machines between data centers or environments. You can only import existing data storage domains that were attached to data centers with a compatibility level of 3.5 or higher. Importing an existing ISO storage domain allows you to access all of the ISO files and virtual diskettes that the ISO storage domain contains. No additional action is required after importing the storage domain to access these resources; you can attach them to virtual machines as required. Importing an existing export storage domain allows you to access all of the virtual machine images and templates that the export storage domain contains. Because export domains are designed for exporting and importing virtual machine images and templates, importing export storage domains is recommended method of migrating small numbers of virtual machines and templates inside an environment or between environments. For information on exporting and importing virtual machines and templates to and from export storage domains, see Exporting and Importing Virtual Machines and Templates in the Virtual Machine Management Guide. Import a storage domain that was previously attached to a data center in the same environment or in a different environment. This procedure assumes the storage domain is no longer attached to any data center in any environment, to avoid data corruption. To import and attach an existing data storage domain to a data center, the target data center must be initialized, and must have a compatibility level of 3.5 or higher. Click the Storage resource tab. Select the data center to which to attach the storage domain from the Data Center drop-down list. Select the Domain Function and Storage Type from the appropriate drop-down lists. All communication to the storage domain is through the selected host and not directly from the Red Hat Enterprise Virtualization Manager. At least one active host must exist in the system and be attached to the chosen data center. All hosts must have access to the storage device before the storage domain can be configured. Enter the details of the storage domain. The fields for specifying the details of the storage domain change in accordance with the value you select in the Domain Function / Storage Type list. These options are the same as those available for adding a new storage domain. For more information on these options, see Section 7.1, “Understanding Storage Domains”. Select the Activate Domain in Data Center check box to activate the storage domain after attaching it to the selected data center. The storage domain is imported, and is displayed in the Storage tab. You can now import virtual machines and templates from the storage domain to the data center. Migrate a storage domain from one data center to another in the same Red Hat Enterprise Virtualization environment to allow the destination data center to access the data contained in the storage domain. This procedure involves detaching the storage domain from one data center, and attaching it to a different data center. Shut down all virtual machines running on the required storage domain. Click the Storage resource tab and select the storage domain from the results list. Click Detach, then click OK to detach the storage domain from the source data center. Select the destination data center and click OK. The storage domain is attached to the destination data center and is automatically activated. You can now import virtual machines and templates from the storage domain to the destination data center. Migrate a storage domain from one Red Hat Enterprise Virtualization environment to another to allow the destination environment to access the data contained in the storage domain. This procedure involves removing the storage domain from one Red Hat Enterprise Virtualization environment, and importing it into a different environment. To import and attach an existing data storage domain to a data center, the target data center must have a compatibility level of 3.5 or higher. Log in to the Administration Portal of the source environment. In the Remove Storage(s) window, ensure the Format Domain, i.e. Storage Content will be lost! check box is not selected. This step preserves the data in the storage domain for later use. Click OK to remove the storage domain from the source environment. Log in to the Administration Portal of the destination environment. Select the destination data center from the Data Center drop-down list. The fields for specifying the details of the storage domain change in accordance with the value you select in the Storage Type drop-down list. These options are the same as those available for adding a new storage domain. For more information on these options, see Section 7.1, “Understanding Storage Domains”. 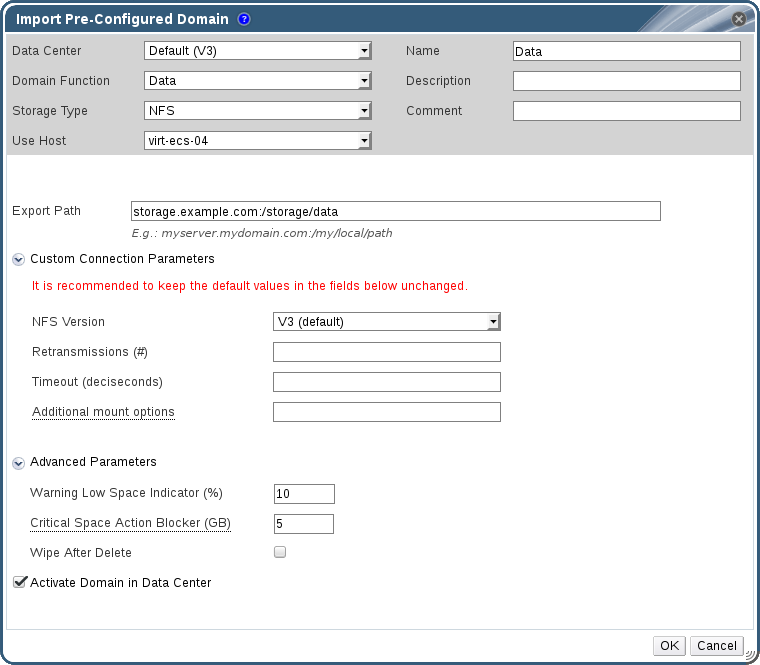 Select the Activate Domain in Data Center check box to automatically activate the storage domain when it is attached. The storage domain is attached to the destination data center in the new Red Hat Enterprise Virtualization environment and is automatically activated. You can now import virtual machines and templates from the imported storage domain to the destination data center. Import a virtual machine from a data storage domain you have imported into your Red Hat Enterprise Virtualization environment. This procedure assumes that the imported data storage domain has been attached to a data center and has been activated. Click the imported data storage domain. Click the VM Import tab in the details pane. Select one or more virtual machines to import. Select the cluster into which the virtual machines are imported from the Cluster list. You have imported one or more virtual machines into your environment. The imported virtual machines no longer appear in the list under the VM Import tab. Import a template from a data storage domain you have imported into your Red Hat Enterprise Virtualization environment. This procedure assumes that the imported data storage domain has been attached to a data center and has been activated. Click the Template Import tab in the details pane. Select one or more templates to import. Select the cluster into which the templates are imported from the Cluster list. You have imported one or more templates into your environment. The imported templates no longer appear in the list under the Template Import tab.